Leeds Bike Mill have received funding from the European Social Fund to deliver bike maintenance courses to people who are age 19+, unemployed/ doing less than eight hours paid a week, and eligible to work in the UK. These are 16 hour courses accredited by the CTC. Please scroll down to view booking information and guideline course content. Individuals: Whether you don’t know the first thing about fixing bicycles or you’ve done a fair bit, you’re welcome to attend this two day course accredited by the CTC, the national cycling charity. If you have your own bike you can do all the repairs on that so by the end you will have a fully serviced bicycle (service worth £90), or you can use one of our donated bikes to practise on. If you don’t have a bike then you will be able to keep the bike you have serviced at the end of the course. 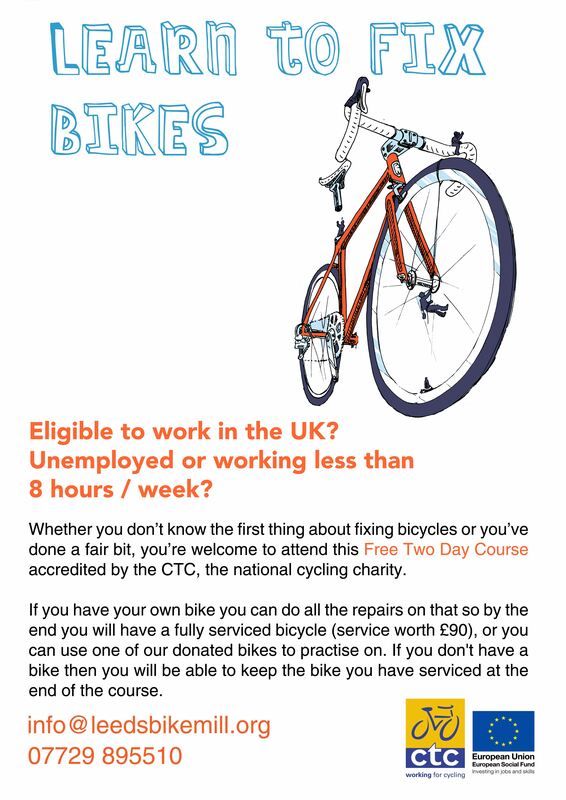 If you meet the eligibility requirements (unemployed or working less than 8 hours a week, and eligible to work in the UK) and are interested then please get in touch by emailing info@leedsbikemill.org or calling 07729 895 510. Organisations and groups: If you have a group of volunteers, members or users who are eligible for a funded course and are interested in finding out more then please contact us to discuss options by emailing info@leedsbikemill.org or calling 07729 895 510. Ideally we need a minimum of 6 trainees to run a course. The training courses are 16 hours in total and can be offered in different formats: 4 sessions of 4-hour blocks, 2 sessions of 8-hour blocks, 8 sessions of 2-hour blocks.